Noise from outside. The walls in our RV are thin. So thin that I can easily hear my kids’ conversation as they play in the yard (good thing), but can also hear my neighbor talking on his cell phone (not a good thing). We’ve all grown accustomed to the ambient noises of our RV park: the highway traffic and Tejano music. But there are two sounds that still wake me up at night: thunderstorms and police sirens. Swaying with movement. Even when we have our RV completely leveled and the jacks tightened down there is still a fair amount of “bounce” to our home. It doesn’t bother me at all during the day, but at night it can keep me awake. I can FEEL it when one of our kids is tossing and turning in their bed or if someone gets up to go potty. No bath tub. Ah… my one, continuous gripe about living in a tiny space! This would not be a big deal if I didn’t LOVE taking baths with an unnatural passion. But after a year of living in an RV, sadly I am not cured. I still jump at the chance to soak in a tub. And when we eventually upgrade to a newer RV, a full-size bathtub is already on my must-have list. Tough to keep cool. Our 30-foot rig has one central A/C unit and it works tirelessly to try to keep us cool in the summer. The thing is, we live in Texas, where summer temps are in the triple digits. It’s almost impossible to keep this tin can cool in sweltering conditions, especially if we are parked in direct sun… Forget it! As with anything, you can choose to focus on the bad or the good. 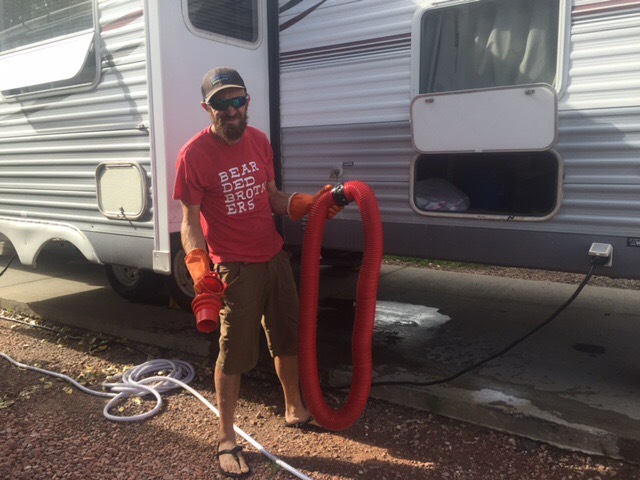 We still think RV life is amazing, even with these drawbacks. Next week I will revisit the top five things I love about RV living and see if they still hold true a year later.